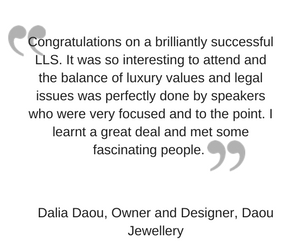 There are ten categories for the Luxury Law Awards 2019. We are inviting nominations and entries for individuals and organisations for consideration by our Jury and the Luxury Law team. They will be looking for evidence of best practice between 1 January 2018 and 1st January 2019. 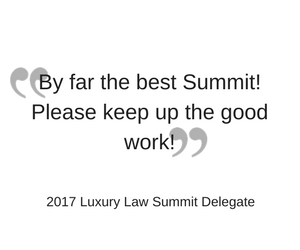 This category is looking to identify a rising talent in the world of luxury law. We are seeking nominations for colleagues who, at the start of their career, have already demonstrated the ability to add real value to the luxury business sector. We are seeking to find an in house legal team which has proved its value to the business in a demonstrable way. The team must be able to show how they met challenges facing their business and/or provided a substantial and measurable contribution to their company’s success over the past year. This could be a new project undertaken by the group, a particular approach to dealing with a particular issue and the solution or examples of how the in-house legal team has worked collaboratively with their colleagues across the business to develop new opportunities. 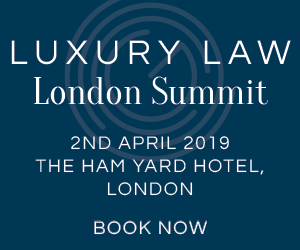 We invite entries from Law Firms with a luxury sector practice able to demonstrate the effective contribution they are making to their clients’ business, through innovations in the services they provide and/or leadership over industry issues. Clients can nominate their law firm and the reasons why whilst we also accept entries from law firms for this category – demonstrating why they deserve to be considered. Examples of innovation, leadership, learning and new initiatives on client care are some of the attributes which will impress the judges. This award recognises the most important corporate deals. Open to deals of any size, the winner will demonstrate why the deal was important, what value they brought to the deal and evidence of legal expertise, innovation and team working. This category is seeking to find a company which has made a significant contribution to sustainability. Our Advisory Board will be asked to nominate an individual who they feel has, during the course of their career, made a substantial contribution to the development of luxury law, to the protection of the luxury brands and to the growth of successful businesses in the luxury sector. 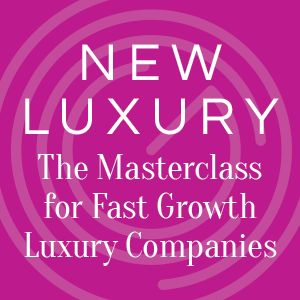 Nominations will be made for the CEO, Designer, Director or executive of a luxury business who, in the past year, has delivered growth for their brands and / or implemented a business development strategy that is innovative and proving effective in the luxury sector, or taken a new brand/ business to the next level. This year’s Luxury IP Counsel is recognised for an outstanding contribution to management of their company’s IP assets and protection of the brand. The winning candidate will demonstrate leadership in the field as well as a key understanding of the IP ecosystem. This award acknowledges those who are at the forefront of disruption and innovation in the luxury marketplace. We are seeking nominations for luxury businesses using technology to its full potential as a driver of business value and which demonstrate leadership in digital innovation. 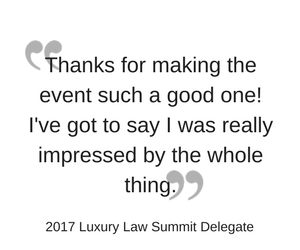 Would you like to become a Luxury Law Summit sponsor for London 2019 or New York 2019?